We normally think about collage as a physical process in which layers of paper are fixed with adhesive to create a composite image. This exhibition proposes that collage is not only tactile and material, but a more nuanced phenomena. Collage is a medium that explores strategies of juxtaposition. Temporal variables, such as history and personal experience can be fixed, if only figuratively, within its accumulated layers. Born generations apart, Benny Andrews (1930-2006) and William Villalongo (born 1975, raised in Bridgeton, NJ) share a deep engagement with the process of collage. Both artists are also notably inventive for the ways they push the two-dimensional limits of painting. Their laminations of paint, paper, Mylar and fabric tell us visual stories, and manage to capture time, narrative and social commentary in layered surfaces. A modest selection of paintings made by Benny Andrews between 1966 and 2004 considers significant moments in the artist’s illustrious career. In his early works from the 1960s, Andrews looked back on his personal history – he was raised in a large, poor sharecropping family in rural Georgia – weaving his experiences together with formal cues taken from the art of that day to create fresh, new experiences. These paintings often featured stylized agricultural imagery – farmers, shacks and chicken coops, and red clay soil. The Long Rows (1966) is exemplary for how it synthesizes the gestural paint-handling of Abstract Expressionism with a tough and tender image of a woman hoeing her way through planted rows of cotton towards a receding horizon. Andrews engaged the traditional genres of landscape, portraiture, and still life with verve, freely mixing what are more conservatively viewed as ‘high’ and ‘low’ cultural references. He dispensed with such restrictive terminologies in his life and his work: “It bothers me not being seen as a more complicated individual. It’s easier to label me as regional, or representational, or Southern, or black” he said. 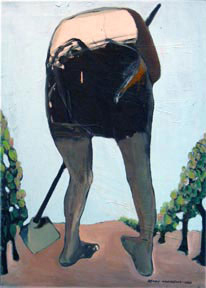 Indeed, from being one of ten children born to a mother who prioritized her children’s education and a father who was a folk artist of renown, to co-founding the Black Emergency Cultural Coalition, and acting for a time as Director of the NEA’s Visual Arts program, Benny Andrews wide-ranging lived experiences are clearly expressed in his exuberant paintings. A parallel complexity can be located in the hybrid form and mixed registers of collage. Perhaps the urge to unite a range of diverse influences is one of the reasons Andrews returned repeatedly to this process. Like Benny Andrews, William Villalongo’s experiments with collaged forms have produced a distinctive and impressive body of paintings. Initially, Villalongo painted on stretched black velvet, and attached additional paintings-on-paper to these surfaces. The imagery in these paintings referenced Surrealism as easily as it did science fiction, and teemed with cosmological signs. More recently, the paper cutouts that were attached to his paintings’ stretched surfaces have migrated from their rectangular constraints, manifesting themselves as shaped and painted panels that are grouped on walls in spatially-engaged tableaus. For his recent exhibition Eden’s Remix, Villalongo combined figurative silhouettes of Adam and Eve borrowed from Masaccio’s The Expulsion from the Garden of Eden with other abstract and botanical forms, creating ‘Paradise’ in the gallery space. Juxtapositions of velvet flocking in baby blue, pink, black and marigold yellow are offset by surfaces of laminated Mylar. There is a great deal of tension on the surfaces of these paintings – the velvet flocking drawing light into its depth, and mirrored silver passages reflecting it back out. Painted eyes cover the front of the panels, uniting the painting’s different material passages. These eyes ease the tensions between the opposing edges, and symbolically look back at viewers who find themselves reflected in the Mylar. 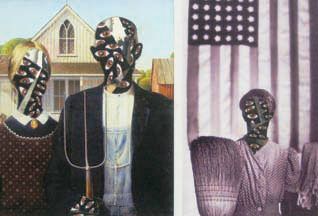 Image credit: Left, William Villalongo, “American Gothic: Grant Wood and Gordon Parks”, 2008, Ink jet prints, velour flocking, Mylar and acrylic. Courtesy the artist and Susan Inglett Gallery, New York. Right, Benny Andrews, “The Long Rows” 1966, Oil on canvas, Courtesy The Benny Andrews Estate.